The above picture can summarize a lot of the happenings this weekend, because I'm sure my race pictures were pretty bad this time. It did not start off the best, because the week did not end well for me due to the realization that doing my dissertation is pseudoly impossible for me both time-wise and cognitively. By Saturday morning, I was back on the task, and I will continue to be. However, my morale is low and will remain so, and the extent to which I care is not the greatest at this time. Anyway, onto better things. "The Ukrainian" and I didn't have that many coins to fill the far-away parking meter at the Expo for this race, so we scurried in the rain to simply pick up our packets and get back. However, I did pick up the shirt I am wearing in this picture, a token of my third run at this race (see here and here for my other experiences with this race). Also, as you can maybe see in my picture, I re-acquired a Phiten X30 necklace at their booth. It is a different design as the original one I got for "The Ukrainian" and I, but the potency is the same. I missed having one of these, even though I've gotten along fine with it over the past two months. With my purchase, I got some titanium-infused patches and stickers. Perhaps that will be the subject of another entry. Finally, I picked up some GU gels for a good deal in several flavors as a bit of a sampler to me. The evening before the race (and I wish I got a picture of this), "The Ukrainian" and I went to In-N-Out Burger for dinner. He wanted to eat burgers, and I said I wouldn't mind eating fries the day before a race like I did for my last race. I didn't (over)indulge myself in animal-style fare (fries topped with some variant of 1000 Island dressing, grilled onion bits, and cheese), so I got a regular order of fries and back topped with with a melted vegan cheddar slice from a pack that the man and I picked up the other day. I rounded out dinner with some dry Peanut Butter Cap'n Crunch. Early the next morning, we left at 4:30 AM to beat the parking rush at this race. I took a few naps in the car, ate a banana, and used the facilities before heading to the start line. It was amazingly sunny. While running, I realized that my two-shirt ensemble (long sleeve under short sleeve tech shirts) was a bit too much. As for the race itself, you can read my other reports for details about the course, but I do recall thinking a few times that I didn't remember the course having so many long (albeit subtle) inclines and even a few tougher inclines toward the beginning. I didn't check my Garmin very often, only at the mile-markers. I noticed I was running pretty well, though my predetermined goal was just to beat 2 hours. I saw "The Ukrainian" at around mile 7 as he was approaching mile 9. Sometime after that point, or maybe even after the turnaround at mile 8.2, my pace slowed. I was running out of energy and have never really been any good at running after 7 miles. NOTE: TMI part begins here [ Around the 10th mile, some of my mini-breakfast made a visit. I didn't stop, and none of it got on me, so I pretended I was just one of those spitting runners. Fortunately or unfortunately, this was not the first time this has happened to me as of late, so I wasn't too freaked out or deterred by it. ] End of TMI. I tried my best to hold a decent pace, and finally, the long, straight last few miles ended. It was definitely a struggle, as my back was tiring and the sun was blinding. During the last few miles, I had a strong feeling I was going to beat my previous PR(1:57). Somehow, my stomach managed to suddenly hurt during the last mile, but I kept going, and I beat my PR by almost 3 minutes. I had been wondering when I'd come in under 1:55, and it only took me 15 tries to do it. 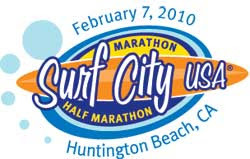 Yep, this was my 15th half-marathon and first race of 2010. That was a great way to commemorate both of those milestones! I got my medal (see the picture above) and met up with "The Ukrainian," Tea Time & M, and her friend D. Everyone did really well (including spectating M, lol). As I was watching/passing some of the marathoners today, I realized that I have LA Marathon on my plate for my next race in March. I know I said this last year, but I am not ready to run a marathon right now. And this time, it's not because I am lacking training. This half-marathon felt very long to me, and I still have some psychological remnants from my marathon in December. I hope that over the next few weeks, the hectic burdens of my everyday life start erasing those memories. Above: Pulling a Michael Jackson during the run, or changing the song on my iPod. Agh, I never fail to look bad in my running photos! Above: Me and my green hankie. Wow - that's planning ahead! Congrats again on the PR, you cut 3 mins, that's huge! Be proud! Random Photo Entry 11: Where Have I Been?